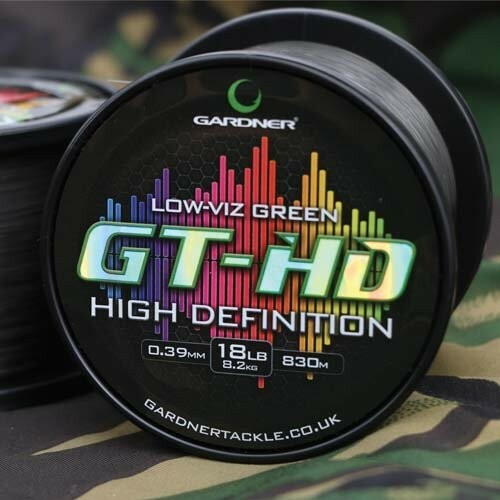 Brand new from Gardner Tackle , GT-HD is a high quality copolymer manufactured with a reduced stretch, low viz colour and high density, making it sink quicker than other monofilaments on the market. After all, why develop a line that offers exceptional feel if it doesn’t retain the high knot strength, great abrasion resistance, fast sinking and a lovely smooth supple feel that anglers want. By developing a main line that brings together all of these features ‘GT-HD’ sets a new benchmark in performance copolymer main lines. Finally, by manufacturing GT-HD in a awesome low-viz colour we’ve created a line that simply outperforms other low stretch lines in every way. Smooth finish and supple feel offers superior casting performance. GT-HD is formulated to sink quickly and settle flush to the lake bed. This line has exceptionally high knot strength and high abrasion resistance. Low-Viz Green colour gives superb camouflage whether you are fishing slack or tight lines. For optimum performance we recommend a Palomar knot with GT-HD (though Grinner and Fig.8 loops will still exceed stated breaking strain). *We recommend spooling up GT-Hd with the label facing upwards (line coming off anti-clockwise) and periodically checking for line twist for the best possible results. FREE Delivery on all Gardner Mono Mainlines over £100!! !